The Amaroo Motel is located one block back from the main street so we are close enough to stroll to all the conveniences but enjoy the quiet of not being in the main street. A beautiful town nestled in the Tumut Valley at the foothills of the Snowy Mountains. Tumut is an exceptionally pretty country town. The Tumut River, which runs for 145 km before joining the Murrumbidgee River at Gundagai, flows along the edge of the town; the plains spread out on either side of the river; and the foothills of the Snowy Mountains rise on all sides. The early settlers planted poplars and willow trees resulting in spectacular displays in summer and autumn. The rainfall ensures that, apart from times of drought, the valley is characteristically green and fertile. Tumut is located 423 km from Sydney and 180 km from Canberra via the Hume Highway. The main access to the town is via Gundagai (34 km) with roads going through both Gocup and Brungle. The town itself has an elevation of 280 m above sea level which means that it is located so that it has four distinct seasons. There is some confusion about the origins of the town’s name. One popular version is that ‘doomut’ was an Aboriginal word for ‘camping ground’ or ‘quiet resting place by the river’ and that over the years this evolved to ‘toomut’, ‘tumat’ and eventually Tumut. Tumut is a charmingly pretty town that changes dramatically with the seasons. 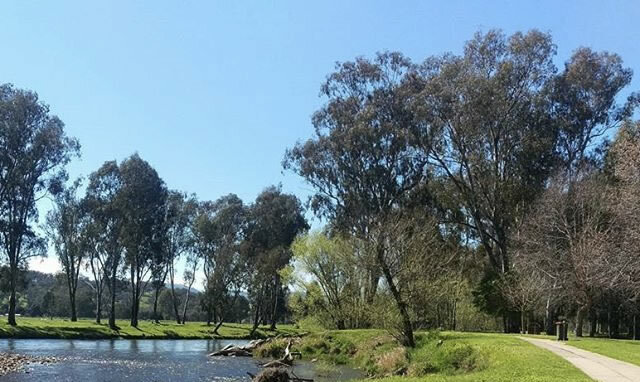 Stroll along the 2 km Tumut River Walk and you will be able to admire the bird life of the Riverglade Wetlands. It is a pretty town with many historic buildings and remnants of a vibrant past which you can uncover on a self-guided heritage trail. The Yarrangobilly Caves in Kosciuszko National Park are intricate limestone chambers made up of stalactites, stalagmites, and corals dating back about 440 million years. Tours of the three main caves run daily (except Christmas Day) and self-guided journeys are also optional. Be sure to bring along your bathers and take a dip in the nearby thermal pool, which stays a toasty 27 degrees year-round. Tumut is part of a region that is a year-round playground. It has an action-packed activities list that includes bushwalking, waterskiing, trout fishing, canoeing, sailing, horse-riding, mountain biking, golf and tennis. Other towns worth visiting are Adelong and Batlow.